Backpacking Trips Photo journey of my adventures. Pack List My personal checklist for a trip. Tips All my tricks to making backpacking easier. Find Me Various ways of getting and keeping in touch. Springtime. 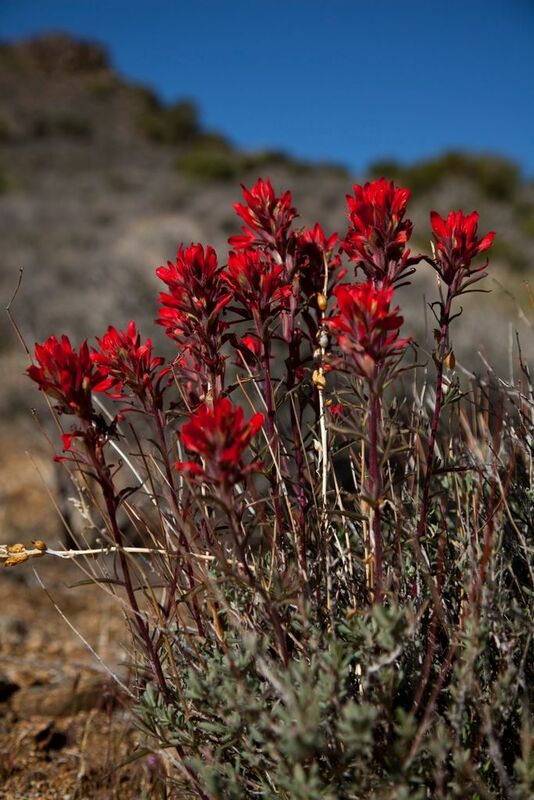 Wildflowers are popping up everywhere, including the desert. Joshua Tree has been on the to-do list for quite some time and after checking the Desert USA website, now was the time to go. So way too late on a Friday afternoon, my buddy Henry and I made the 3+ hour trip to JT. We weren't sure exactly where were going to backpack but we had a few ideas. Once we got to the park (west entrance), the visitor's center was closed so we attempted to ask the ranger at the entrance if he had any suggestions on good places to backpack. He attempted to offer some advice, but on further investigation, he hadn't personally seen any of the backcountry himself. His response was more along the lines of, "It's the middle of the desert so I don't go out there". Good point. 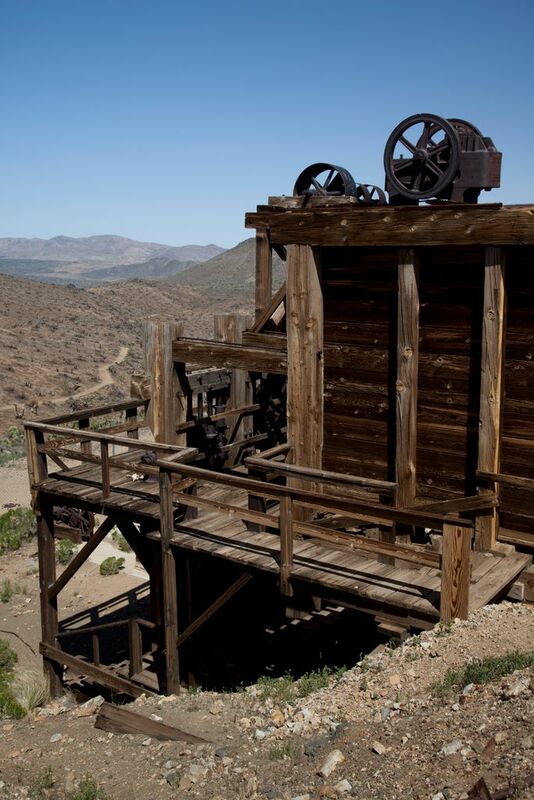 We decided to check out the Lost Horse Mine Loop and make a two night trip out of it. We only had about two hours or so of light so we made a bee line for the Juniper Flats parking lot, posted our itinerary on the backcountry board and headed out. Since it is the desert, we made sure we each had roughly two gallons of water, one gallon for each day. Extra weight that I was not looking forward to lugging around with me, but the lack of elevation helps the situation. We ended up hiking for about two miles before the sun started to approach the horizon and we pitched camp. That night, the temperatures dropped into the low 40s, which prompted me to wake up every time i accidentally knocked the beanie off my head. A somewhat uneasy night meant that I was wide awake for the sunrise. 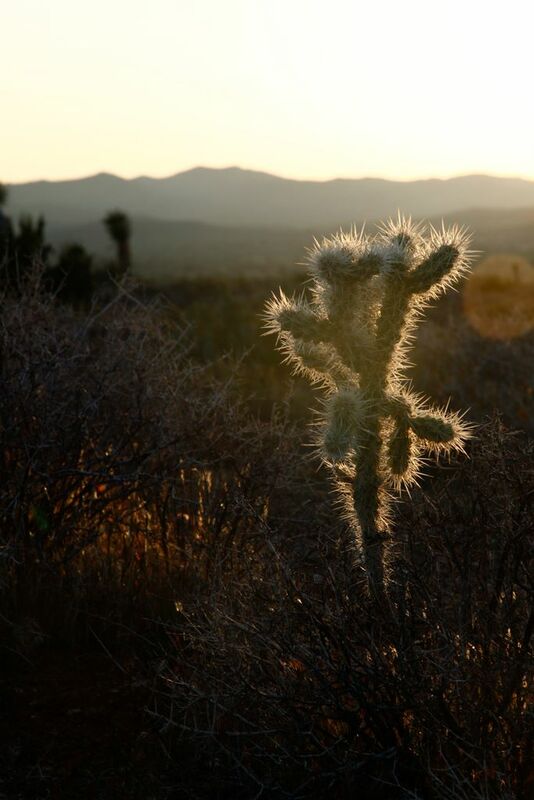 I was happy to see the sun's rays fill the valley we spent the night and illuminate the large Joshua Trees surrounding us. After basking in the sun while enjoying some granola for breakfast, we packed up and started out towards the Lost Horse Mine. Most of our trek would be in the high (Mojave) desert where we enjoyed the subtle wildflowers that dotted the landscape. 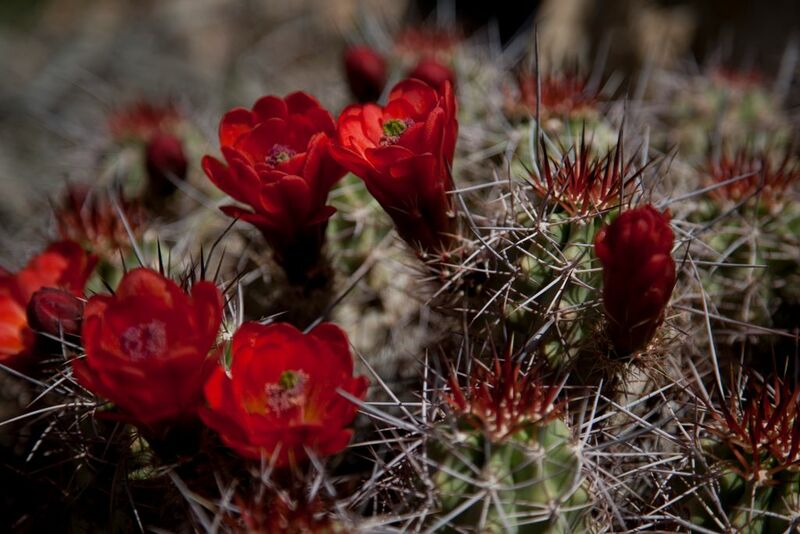 The most apparent were from the claret cup cactus, which were bright red and not easily missed. There were also a variety of small yellow, purple and white flowers that were barely noticeable. As we neared the Lost Horse Mine, we encountered a burned section of the park that resembled being on the moon. Just past that was the small wooden structure of the mine surrounded by a barbed wire fence. There were about half a dozen other people that were all visiting the mine as a day hike. We walked around the mine and then hung out just above it on the hill to wait for some of the people to go so we could find a way into the fenced off area and get a closer view. While waiting, we noticed a large buzzing noise behind us, when we turned to see a swarm of bees just further up the hill. Not sure what their intentions were, we vacated the area. Heading back down the hill, some of the other people had wiggled their way under the fence so we followed suit. There didn't appear to be a way into the mine, which is probably for the best as it sits on top of a 500 foot vertical shaft. After exploring the area sufficiently, we continued along the loop. Once past the mine, we no longer saw any other hikers. 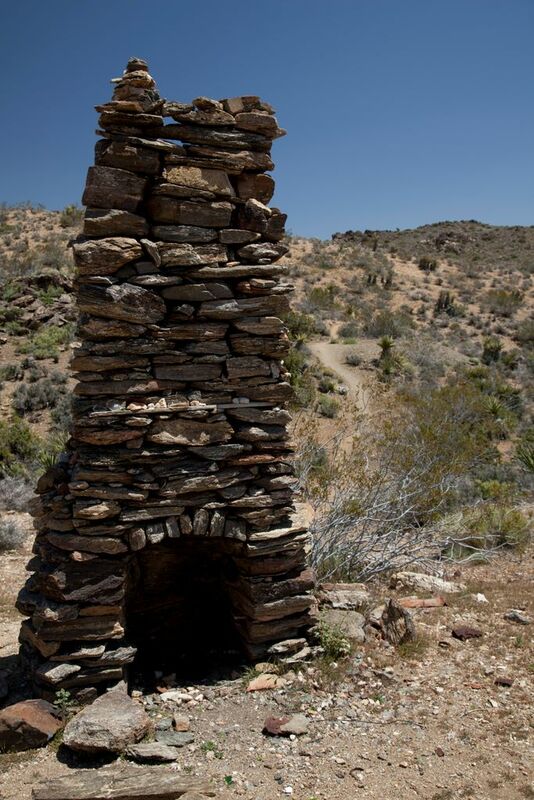 We did however come across the remnants of an old bunkhouse, with only the chimney and a cot left. After that, the trail continued south and eventually provided nice views of the lower (Colorado) desert. The lower portion looked much less hospitable and I was glad we chose the route we did. Another mile of hiking, we decided to set up camp and do some exploring. We rummaged around in the rocky hills and eventaully found a nice spot to watch the sun set. There were no clouds in the sky so it was somewhat unremarkable, but still very enjoyable. With the sun gone, the temperatures began to drop, which meant it was time to retire to the tent. The next morning, we took our time packing things up and then set off for the short trip to the car. Along the way, we lost the trail amidst the numerous washes and ended up on the road for the last mile of the trip. By the time we got back to the car, it was only 11am so we headed south to check out Keys View. It overlooked the Coachella Valley with views of both San Bernadino and San Jacinto in the distance. The hazy view was similar to what we viewed over the previous two days, so after a few minutes, it was time to head home. Joshua Tree turned about to be a very interesting park with sights that I have not seen anywhere else. However, the fact that it was 500,000 acres of wilderness is a bit decieving and you're never that far from a road while in the park. If we went with the intention of rock climbing (which I want to do), I think we would have been much more pleased. As it stands, I think Anza Borrego is more suited to backpacking.